Now, this button looks pretty harmless, but it can be confusing. The reason is that, when you press it, it downloads a file with the .rps file extension. If you download the file, then open it, you will be taken immediately to the Acumatica Report Designer login screen where you just have to enter your password. Once you enter your password, it appears that you just opened the report from the .rps file which might lead you to believe that the .rps file is the report definition file. The .rps file is actually nothing more than a file that automatically fills out some of the fields in the Acumatica Report Designer login screen. 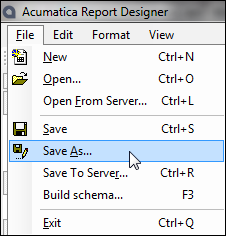 As you can see from the screenshots above, the .rps file is only 3 lines and it is simply a text file that stores the information needed for the Report Designer program to go and find the actual report definition file in the Acumatica application. However, the .rpx file is 964 lines in our example. It is an XML file that stores the full report definition and allows Report Designer to open the entire report definition without needing to talk to the Acumatica application. So, if you were on a computer without an internet connection, you could open an .rpx file, but not an .rps file.